Fractional 2009 American Eagle Gold Bullion Coins were released today and initial reports by the US Mint show they are on fire, with sales already approaching totals from all of 2008. Spurring demand are bullish gold prices. The yellow metal was driven to another record of $1,227.50 an ounce in New York on Thursday, marking a third straight day of all-time highs. Gold has now closed at a fresh high for the 20th trading day since Nov., and is up 38 percent this year. Last week’s US Mint suspension of the one-ounce size due to "strong demand" and a "depleted" inventory also helped the fractionals. As announced in early Oct., the US Mint released the Eagle Gold Bullion Coins in one-half ounce, one-quarter ounce, and one-tenth ounce weights. Together, the Mint sold 345,000 coins to its authorized purchasers for a total of 58,000 ounces of gold. That, without a single one-ounce size leaving Mint doors. *As reported by the US Mint on Dec. 3, 2009. 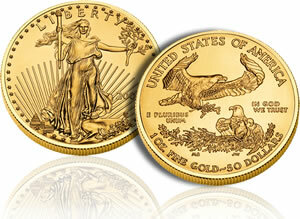 Sales of 2009 one-ounce sized gold eagles are expected to resume in "early December" while the production of the 2010-dated American Eagle Gold and Silver One Ounce Bullion Coin are expected to begin in Jan., 2010.